Nearly fifteen years ago, while the construction of its Renzo Piano-designed expansion was under way, the Morgan embarked on a new program of acquisitions of modern and contemporary drawings. The goal was to bring to the present a collection that, until then, was known for its old-master and nineteenth-century sheets. This presentation of works created between the 1940s and 2017 pays tribute to the generosity of the collectors and other donors who have helped build the collection, thereby expanding the mission of the Morgan to include the preservation, study, and display of drawing up to the present. It includes works by the Mexican Surrealist Gunther Gerzso, Conceptual artist Roman Opalka, and sheets by Nicole Eisenman, Lee Lozano, and Edda Renouf, among others. Joe Zucker (American, b. 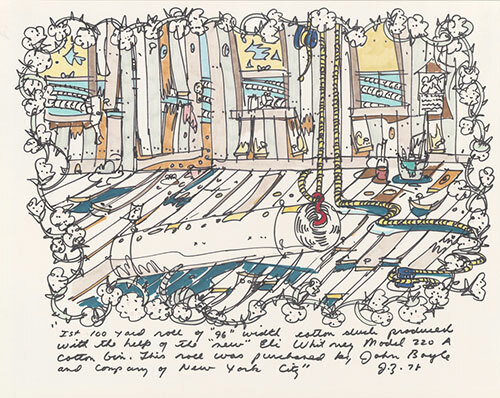 1941), "First 100 yard roll of '96' width cotton duck...", 1978, felt-tip pen, 18 15/16 x 24 inches (48.1 x 60.96 cm). Gift of Sandra K. Silver; 2017.380. Courtesy of Joe Zucker.